VIP, have been specialists in Indian Mandaps since 1995. If you have chosen VIP then you have made the right choice as your wedding day should be a glorious, harmonious and at the very least a classy affair. Your guests will witness the bonding of two hearts and if Indian tradition prevails it is also the union of two families. Creating the right atmosphere for your guests is of the utmost importance. VIP Decorating boasts the largest collection of Mandaps in Sydney. Our Mandaps range from our signature Silken Draped to the Grand Haveli Mandap. With over 20 Mandaps and many of which can be interchanged to either a 4 Pillar version or to a 6 Pillar version and also round, square and even rhombus shaped options. 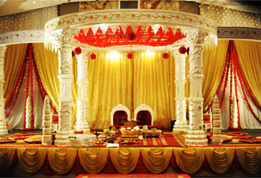 Once you have chosen the venue and finalised your guest list you can begin considering the size of your Mandap. The entrance to each venue differs and therefore some may not require a lot of decorating. You may choose a religious relic or go for a modern twist and add a gate piece and more bling. Aisle setups can range from a simple red carpet to matching accessories to the Mandap. Most of VIP Mandaps have matching pedestals and to compliment you can either choose a statue of dancing ladies, selection of ganesh or radha krishna statues, musical instruments, a vase with fresh flowers or many other VIP options.